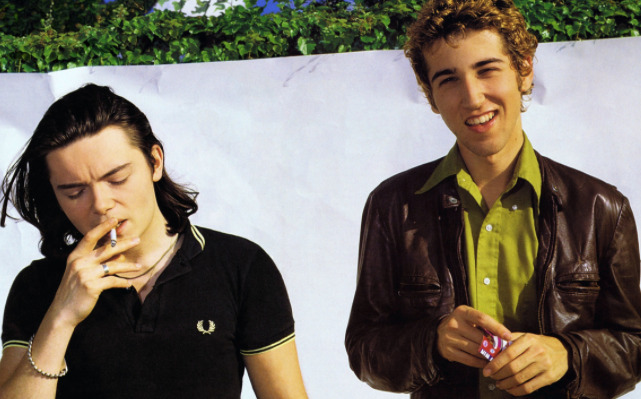 Guy-Manuel De Homern Christo and Thomas Bangalter (Daniel Vangarde's son) , alias Daft Punk. Daniel "Vangarde" Bangalter is the father of Thomas Bangalter and he is credited with aiding the duo in their early musical career. Daft Punk is a French electronic music group. The two members are Thomas Bangalter (born January 3, 1975) and Guy-Manuel de Homem-Christo (born February 8, 1974.) Bangalter and de Homem-Christo were previously in the rock band Darlin' with Laurent Brancowitz. After Brancowitz left the group to join his brother's band, Phoenix, the remaining duo formed Daft Punk. Daft Punk reached significant popularity in the late 1990s house movement in France and met with continued success in the years following, combining elements of house with synthpop The duo is credited with producing songs that are considered essential in the French house scene. The group was managed from 1996 to 2008 by Pedro Winter (Busy P), the head of Ed Banger Records. Early in the group's career, the band members were influenced by groups including The Beach Boys and The Rolling Stones. Bangalter and de Homem-Christo were originally in a band called Darlin', which disbanded after a short period of time, leaving the two to experiment musically on their own. The duo became Daft Punk, releasing its critically acclaimed debut album Homework in 1997. The 2001 release of Discovery was even more successful, driven by the club singles "One More Time", "Digital Love", and "Harder, Better, Faster, Stronger". In March 2005, the duo released the album Human After All to mixed reviews. However, the singles "Robot Rock" and "Technologic" achieved success in the United Kingdom. Daft Punk toured throughout 2006 and 2007 and released the live album Alive 2007, which won a Grammy Award for Best Electronic/Dance Album. The duo composed the score of the film Tron: Legacy and in 2010 released the soundtrack album of the film. In January 2013, Daft Punk left EMI Records for Sony Music Entertainment's subsidiary label Columbia, and released Random Access Memories in 2013 to critical acclaim. Thomas Bangalter and Guy-Manuel de Homem-Christo met in 1987 while attending the Lycée Carnot, a secondary school in Paris. The two became good friends and later recorded demo tracks with others from the school. This eventually led to the formation of the guitar-based group called Darlin' with Laurent Brancowitz in 1992 Bangalter and de Homem-Christo played bass and guitar, respectively, while Brancowitz performed on drums. The trio had branded themselves after The Beach Boys song of the same name, which they covered along with an original composition. Stereolab released both tracks on a multi-artist Duophonic Records EP and invited the band to open for stage shows in the United Kingdom. Bangalter felt that "The rock n' roll thing we did was pretty average, I think. It was so brief, maybe six months, four songs and two gigs and that was it." A negative review in Melody Maker by Dave Jennings subsequently dubbed the music "a daft punky thrash." Instead of dismissing the review, they found it amusing . As de Homem-Christo stated, "We struggled so long to find [the name] Darlin', and this happened so quickly." Darlin' soon disbanded, leaving Brancowitz to pursue other efforts with Phoenix.Bangalter and de Homem-Christo formed Daft Punk and experimented with drum machines and synthesizers. In 1993, Daft Punk attended a rave at EuroDisney, where they met Stuart Macmillan of Slam, co-founder of the label Soma Quality Recordings. The demo tape given to Macmillan at the rave formed the basis for Daft Punk's debut single, "The New Wave", a limited release in 1994 . The single also contained the final mix of "The New Wave" called "Alive", which was to be featured on Daft Punk's first album. “	Many record companies offered us deals. They came from everywhere, but we decided to wait—partly because we didn't want to lose control of what we had created. We turned down many record companies. We weren't interested in the money, so we turned down labels that were looking for more control than we were willing to give up. In reality, we're more like partners with Virgin." "Da Funk" and "Alive" were later included on Daft Punk's 1997 debut album Homework. The album was regarded (according to whom?) as an innovative synthesis of techno, house, acid house and electro styles. "Da Funk" was also included on The Saint film soundtrack. It was during this period of change in dance music that Daft Punk became largely successful. They combined the aforementioned music styles with crowd pleasing elements of rave. The most successful single from Homework was "Around the World", which is known for the repeating chant of the song's title. Daft Punk also produced a series of music videos for Homework directed by Spike Jonze, Michel Gondry, Roman Coppola and Seb Janiak. The collection of videos was released in 1999 and titled D.A.F.T. : A Story About Dogs, Androids, Firemen and Tomatoes. By 1999, the duo was well into the recording sessions for its second album, which had begun a year earlier. The 2001 release of Discovery took on a slicker and distinctly synthpop-oriented style, initially stunning fans of Daft Punk's previous material in Homework. The group states that the album was conceived as an attempt to reconnect with a playful, open-minded attitude associated with the discovery phase of childhood. This accounts for the heavy use of themes and samples from the late '70s to early '80s era on the album. The album reached No. 2 in the United Kingdom, and its single, "One More Time", was a major club and mainstream hit that nearly topped the UK Singles Chart. The song is well known for being heavily Auto-Tuned and compressed. The song and album created a new generation of fans mainly familiar with the second Daft Punk release. The singles "Digital Love" and "Harder, Better, Faster, Stronger" were also very successful in the UK and on the United States dance chart. The song "Face to Face" hit No. 1 on the USA club play charts despite a limited single release. A 45-minute excerpt from a Daftendirektour performance recorded at Birmingham, UK in 1997 was also released in 2001, titled Alive 1997. The year 2003 saw the release of the feature-length animated film, Interstella 5555: The 5tory of the 5ecret 5tar 5ystem. Daft Punk produced the film under the supervision of Leiji Matsumoto, who the members of the duo have said is their childhood hero. The album Daft Club was also released to promote the film. It features a collection of remixes previously made available through an online membership service of the same name. Starting on 13 September and ending on 9 November 2004, Daft Punk devoted six weeks to the creation of new material. The duo released the album Human After All in March 2005. Reviews were mixed, mostly citing its overly repetitive nature and seemingly rushed recording. The singles taken from this album were "Robot Rock", "Technologic", "Human After All", and "The Prime Time of Your Life". The earliest official statement from Daft Punk concerning the album was "we believe that Human After All speaks for itself." A Daft Punk anthology CD/DVD titled Musique Vol. 1 1993–2005 was released on 4 April 2006. It contains new music videos for "The Prime Time of Your Life" and "Robot Rock (Maximum Overdrive)". Daft Punk also released a remix album of Human After All called Human After All: Remixes. A limited edition included two kubricks of Daft Punk as robots. Daft Punk released its second live album titled Alive 2007 on 19 November 2007. It contains the duo's performance in Paris from its Alive 2007 tour. The live version of "Harder, Better, Faster, Stronger" from Alive 2007 was released as a single. Olivier Gondry directed a music video for the single that features footage shot by 250 audience members at Daft Punk's Brooklyn appearance at KeySpan Park, Coney Island. Following the Alive 2007 tour, the duo focused on other projects. A 2008 interview with Pedro Winter revealed that Daft Punk returned to its Paris studio to work on new material. Winter also stepped down from managing the duo to focus attention on his Ed Banger Records label and his work as Busy P. He stated in a later interview that Daft Punk is working with an unspecified management company in Los Angeles. The duo held its Daft Arts production office at the Jim Henson Studios complex in Hollywood, California. In 2008, Daft Punk placed 38th in a worldwide official poll of DJ Magazine after debuting at position 71 in the year before. On 8 February 2009, Daft Punk won Grammy Awards for Alive 2007 and its single "Harder, Better, Faster, Stronger". Janet Jackson's song "So Much Betta" from her 2008 album Discipline features a sample of Daft Punk's song "Daftendirekt". At the 2009 San Diego Comic-Con, it was announced that the duo composed 24 tracks for the film Tron: Legacy. Daft Punk's score was arranged and orchestrated by Joseph Trapanese. The band collaborated with him for two years on the score, from pre-production to completion. The score features an 85-piece orchestra, recorded at AIR Lyndhurst Studios in London. Joseph Kosinski, director of the film, referred to the score as being a mixture of orchestral and electronic elements. The members of Daft Punk also make a cameo appearance as disc jockey programs wearing their trademark robot masks within the film's virtual world. Tron: Legacy co-star Olivia Wilde stated that the duo may be involved with future promotional events related to the film. A teaser trailer features Daft Punk and their track "Derezzed" from Tron: Legacy. The soundtrack album of the film was released on 6 December 2010. A deluxe 2-disc edition of the album was also released that includes a poster of the duo from the film. Additional bonus tracks are also available through various online vendors. An official music video for "Derezzed", with a running time of less than two minutes, also premiered on the MTV Networks on the same day the album was released. The video, which features Olivia Wilde as Quorra in specially shot footage, along with images of Daft Punk in Flynn's Arcade, was later made available for purchase from the iTunes Store and included in the DVD and Blu-ray releases of the film. Walt Disney Records released a remix album of the score titled Tron: Legacy In 2010 Daft Punk were admitted into the Ordre des Arts et des Lettres, an order of merit of France. 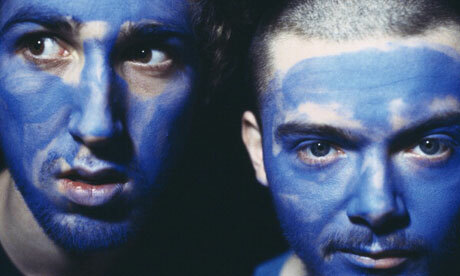 Bangalter and de Homem-Christo were individually awarded the rank of Chevalier (knight). Soma Records released a previously unpublished Daft Punk track called "Drive" that was made while the duo was still with Soma Records and recording "Rollin' and Scratchin'" and "Da Funk". The track was included in a 20th anniversary multi-artist compilation of the Soma label. In October 2011, Daft Punk placed 28th in a "top-100 DJs of 2011" list by DJ Magazine after appearing at position 44 in the year before. On 19 January 2012, Daft Punk ranked No. 2 on Mixmag's Greatest Dance Acts of All Time, with The Prodigy at No. 1 by just a few points. Daft Punk worked on their fourth studio album, Random Access Memories in collaboration with singer-songwriter Paul Williams and Chic frontman Nile Rodgers. In May 2012 it was also announced that Giorgio Moroder had collaborated with the duo, recording a monologue about his life in a vocal booth containing microphones ranging from 1960 to present day. Chilly Gonzales stated in an interview that he had performed material for the duo's project in a one-day session: "I played for hours and they’re gonna grab what they grab and turn it into whatever." He also said that the album would be released "next spring". Fourplay member Nathan East later mentioned that he had contributed to the project. In January 2013, de Homem-Christo revealed that Daft Punk was in the process of signing with Sony Music Entertainment through the Columbia Records label, and that the album would have a spring release. A report from The Guardian followed specifying a release date of May 2013. On 28 February, Daft Punk's official website and Facebook page featured a picture of the duo's helmets, with a "Columbia" logo in the corner, to announce the Columbia signing. On 2 March, a fifteen-second television advertisement aired during the Saturday Night Live program—it depicted an animated, stylized version of the band's logo and the aforementioned image of the helmets. On 23 March, a pre-order page for the new album appeared on iTunes and this was the first time that the title Random Access Memories was revealed, together with a release date of 21 May 2013. The official website for the album and an updated television advertisement were also unveiled. On 3 April, the official album website launched The Collaborators, a series of 16mm documentary videos about the album. The details of the album were then announced and the 79th Annual Wee Waa Show, held on 17 May 2013 in the rural Australian town of Wee Waa, was selected as the launch venue. However, no actual members of Daft Punk were in attendance. On 12 April, a video preview for the song "Get Lucky", in which Pharrell Williams and Nile Rodgers appear, was played at the Coachella Valley Music and Arts Festival. The radio edit of the song was released as a digital download single on 19 April 2013. "Get Lucky" became Daft Punk's first UK No. 1 single on 28 April 2013 remaining at number one for 4 weeks (as of 24 May) and the Spotify music streaming website reported that the song is the most-streamed new song in the service's history. Daft Punk were scheduled to appear on the August 6 episode of The Colbert Report to promote Random Access Memories, but were unable to do so because of conflicting obligations regarding the duo's future appearance at the 2013 MTV Video Music Awards. According to Stephen Colbert, Daft Punk were unaware of any exclusivity agreement and were halted by MTV executives the morning prior to the taping. Colbert nevertheless broadcast an elaborate sketch of himself dancing to "Get Lucky" with various celebrities, including Hugh Laurie, Jeff Bridges, Jimmy Fallon, Bryan Cranston, Jon Stewart, Matt Damon, and The Rockettes. At the Video Music Awards, Daft Punk debuted a trailer for their single "Lose Yourself to Dance," and presented the award for "Best Female Video" alongside Rodgers and Pharrell. Bangalter and de Homem-Christo have credited many sources that influenced their musical style. Years before producing electronic music as a duo, they shared tastes for Elton John, MC5, The Rolling Stones, The Beach Boys and The Stooges. Their mutual admiration for rock bands led to the founding of their own indie group called Darlin'. Bangalter explained: "It was still maybe more a teenage thing at that time. It's like, you know, everybody wants to be in a band." In addition to rock, they drew inspiration from the early 1990s United Kingdom acid house genre. De Homem-Christo referred to Screamadelica by Primal Scream as the record that "put everything together" in terms of genre". The liner notes of Homework pay tribute to a large number of musical artists and contain a quote from Brian Wilson. Bangalter stated: "In Brian Wilson's music you could really feel the beauty—it was very spiritual. Like Bob Marley, too." When questioned on the success of Daft Punk's debut album and the rising popularity of their associated musical genre, Bangalter said, "before us you had Frankie Knuckles or Juan Atkins and so on. The least you can do is pay respect to those who are not known and who have influenced people." 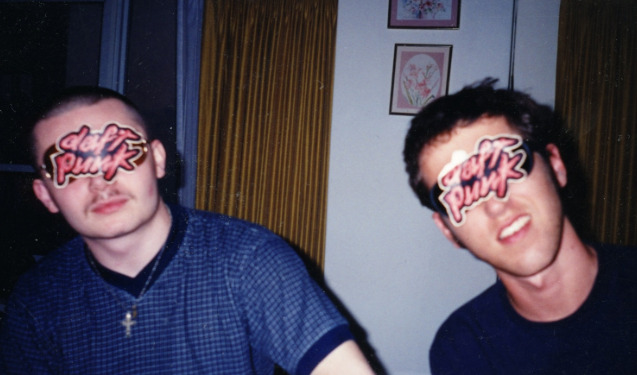 The Daft Punk track "Teachers", from Homework, refers to several influences, such as Romanthony and Todd Edwards. De Homem-Christo stated: "Their music had a big effect on us. The sound of their productions—the compression, the sound of the kick drum and Romanthony's voice, the emotion and soul—is part of how we sound today." A 2011 Bodytonic podcast featured tracks from all of the artists named in "Teachers", the Brian Wilson speech quoted in the liner notes of Homework, and a Kraftwerk-like 1983 track produced by Daniel Vangarde, father of Bangalter. Romanthony and Edwards later collaborated with Daft Punk on tracks for Discovery. For the album, Daft Punk focused on new styles of electronic music. A major inspiration was the Aphex Twin single "Windowlicker", which was "neither a purely club track nor a very chilled-out, down-tempo relaxation track", according to Bangalter. The duo also utilized vintage equipment to recreate the sound of an artist from a previous era. As stated by de Homem-Christo, "On 'Digital Love' you get this Supertramp vibe on the bridge," which was generated through an in-studio Wurlitzer piano. During a later interview, De Homem-Christo clarified that "we didn't make a list of artists we like and copy their songs" Daft Punk would collaborate with Edwards again on the song "Fragments of Time", featured on the 2013 album Random Access Memories. During a 2009 interview, Bangalter named Andy Warhol as one of Daft Punk's early artistic influences. For the Tron: Legacy soundtrack, the duo drew inspiration from Wendy Carlos, the composer of the original Tron film, as well as Max Steiner, Doris Norton, Bernard Herrmann, John Carpenter, Vangelis, Philip Glass and Maurice Jarre. Daft Punk later sought a "west coast vibe" during the production of Random Access Memories, referencing such bands as Fleetwood Mac, The Doobie Brothers and the Eagles. They also highlighted the influence of Jean Michel Jarre in an interview following the album's release. Their outward personae have also changed over time. During their Homework years, the duo would usually wear masks to hide their appearance. When not wearing disguises, they occasionally preferred to be replaced by animation (as they appeared in The Work of Director Michel Gondry DVD) or have their faces digitally obscured for press kits. Not many official photos of the duo's faces exist, including a blurry one found in the Homework liner notes. In their more visible Discovery years, they appeared wearing robotic headgear and metallic gloves for publicity photo shoots, interviews, live shows and music videos. The helmets, engineered by Tony Gardner and Alterian, Inc., are capable of various LED effects. Wigs were originally attached to both helmets, but the duo removed them just before the outfits were publicly unveiled in 2001. Daft Punk introduced the costumes to many U.S. television viewers through an advertisement for a special presentation of their videos during Cartoon Network's Toonami block. Thomas Bangalter once stated, "We did not choose to become robots. There was an accident in our studio. We were working on our sampler, and at exactly 9:09 am on September 9, 1999, it exploded. When we regained consciousness, we discovered that we had become robots." Daft Punk have said that they donned their robot masks to easily merge the characteristics of humans and machines. However, Bangalter later stated that the costumes were initially the result of shyness. "But then it became exciting from the audiences' point of view. It's the idea of being an average guy with some kind of superpower." When asked whether the duo expressed themselves differently within the robotic suits, Bangalter stated "No, we don't need to. It's not about having inhibitions. It's more like an advanced version of glam, where it's definitely not you." With the release of Human After All, the musical duo's outfits became slightly less complicated by consisting of black leather jacket and pants and simplified versions of the Discovery headgear. The attire was designed by Hedi Slimane. “	We don't believe in the star system. We want the focus to be on the music. If we have to create an image, it must be an artificial image. That combination hides our physicality and also shows our view of the star system. It is not a compromise. We're trying to separate the private side and the public side. It's just that we're a little bit embarrassed by the whole thing. We don't want to play this star system thing. We don't want to get recognised in the streets. Yes. Everyone has accepted us using masks in photos so far, which makes us happy. Maybe sometimes people are a little bit disappointed but that's the only way we want to do it. We think the music is the most personal thing we can give. The rest is just about people taking themselves seriously, which is all very boring sometimes." n the same interview, he was also asked a question if stardom can be avoided. Il duo parigino ha cominciato a fare musica solo qualche anno fa e il loro ingresso ufficiale nelle charts europee è stato subito trionfale. Guy-Manuel De Homern Christo e Thomas Bangalter, alias Daft Punk, amici da lungo tempo, ispirati dal rock'n roll di Andrew Weatherall, giovanissimi, hanno cominciato a comprare apparecchiature musicali allo scopo di assemblare uno studio di registrazione da utilizzare per le loro composizioni. Come molti coetanei, lo hanno installato nelle loro camere da letto ed hanno cominciato a 'giocare' con suoni, campionatori, mixer, computers .... La prima collaborazione discografica è con una label indipendente specializzata in dance, la Glasgow's Soma Records, e i primi mix stampati incontrano subito il favore di molti fans catturati dalla carica rock coniugata con la tecno, dei loro brani. Il successo del singolo 'Da Funk' li vede convolare a nozze con la Virgin Recors, sempre pronta a cogliere sul nascere i nuovi talenti. In classifica attualmente con 'One More Time', ces deux bonhommes hanno presentato al recente Midem di Cannes (Francia) la nuova prossima uscita. Il titolo del lavoro è "Discovery", ma non sarà un semplice CD. Inclusi troverete: software, una socio-card e il link del nuovo sito WEB (Daft Club) che permetteranno ai fans di accedere a contenuti musicali inediti ed esclusivi e a downloads fino a 31 dicembre 2002. Numerose e in continuo aggironamento le sorprese digitali che troverete nel loro nuovo sito, attualmente ancora 'coming soon'.